The booklet note isn't telling us who Heiner Goebbels is. Fortunately, ECM Records' New York office sent me a press kit, so I can report that Goebbels was born in 1952 in Germany, and that he has been associated with everything from radio plays to experimental rock. His first ECM recording was made 20 years ago, yet this is the first I'm hearing of him. I was mightily impressed with this CD, which contains some of the most original (and confrontational) music I've heard in a while. Others are impressed too: Surrogate Cities had its American première at the Spoleto Festival in Charleston, SC in June 2000, and Simon Rattle, when he takes over his new position with the Berlin Philharmonic, will be commissioning a new piece from Goebbels. 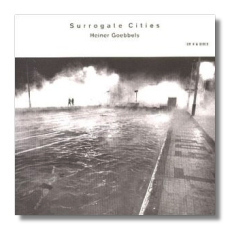 Surrogate Cities is a collection of five works: a Suite for Sampler and Orchestra, The Horatian – Three Songs, D & C, Surrogate, and In the Country of Last Things. Goebbels writes that "Surrogate Cities is an attempt to approach the phenomenon of the city from various sides, to tell stories of cities, expose oneself to them, observe them; it is material about metropolises that has accumulated over the course of time." The Suite for Sampler and Orchestra is in ten sections, each named after a Baroque dance movement. The sampler allows each section to incorporate sound materials not normally available to a symphony orchestra. For example, antique recordings of Jewish cantors are sampled in the first section ("Chaconne"). Goebbels writes of "industrial noise [… ], subcultural 'noise' and the sounds of history" in this "vertical section of the city." I took many notes as I was listening to this work. Some of my comments include "the noise of something heaving itself up from more subterranean levels," "Stockhausen's musique concrète with a lot more urban hipness," and "an unsettling powerhouse of unknown and uncontrollable function." Goebbels's music is frequently violent, almost assaultive. In The Horatian, Goebbels's texts are poems by Heiner Müller. Ancient Rome and Alba are at war. Rather than pitting their armies against each other, each city chooses a single warrior by lottery: Rome a Horatian, and Alba a Curiatian. The Curiatian is engaged to the Horatian's sister. The Horatian slays the Curiatian in one-on-one combat and is the victor. When he returns to Rome, his sister demands the return of her betrothed. He then slays her in anger – the victor is now also a murderer, and he is executed. This story is told in three songs that form an arc of challenge, combat, and aftermath. The vocal writing is an extraordinary mix of rock, jazz, and classical styles, and it demands a strong vocal actress as well as a throat of steel. (It gets both of these things from the astonishing Jocelyn B. Smith.) Because of the violence of the modern musical setting, this antique theme seems to be equally relevant to today's gang warfare issues. I've already enthused about Smith and Moss, and my enthusiasm for Goebbels is a given, so let me say a word or two about the orchestra. The Junge Deutsche Philharmonie is comprised of top students from German conservatories. They are "democratically-organised," which means, I think, that they vote on matters such as repertoire and membership. What they have done here is astonishingly confident. ECM's sound may cause plaster damage in your listening room. (That's praise, in case there's any doubt.) As always, the presentation is artistic, but the booklet fails to share much of the information one would want to have about an unfamiliar composer, as I noted at the start of this interview. Nevertheless, Surrogate Cities is a violently exciting entry into a new sound-world, and as such, it is not to be missed.